to Dutch Elm Disease, an introduced fungus that is spread by bark beetles. years, through the creation of a Tree Trust. Photos from the Dirt Doctor's visit a few years ago. YARMOUTH, Maine — The massive elm tree that shaded the corner of East Main Street and Yankee Drive was sick. Like so many others in so many of America's towns in the 1950s, it was stricken with Dutch elm disease. Tree warden Frank Knight was so smitten with the tree that he couldn't bear to cut it down. After all, it had been standing sentinel in this New England village since before the American Revolution. Over the next half-century, Knight carefully nursed the tree, spraying for pests and pruning away the dreaded fungus, even as the town's other elms died by the dozens. As he succeeded, the stately tree's branches reached 110 feet skyward, its leaves rustling in summer breezes off the Royal River and its heavy limbs shouldering winter snowfalls. 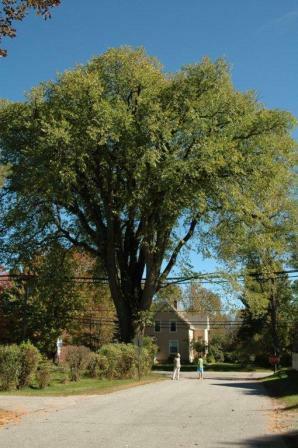 The tree, nicknamed Herbie and acclaimed as the tallest and oldest elm in New England, survived 14 bouts of Dutch elm disease in all, thanks to Knight's devotion. Now the disease ravages again and Herbie is too weak to fight back. Knight, now 101, said there's nothing else he can do to save the tree he's watched over for five decades. "He's an old friend," Knight said, speaking with passion while gazing up at the tree just before Christmas. "I love that tree. There's no question. And I feel so proud that we kept him for so long." Herbie, estimated to be about 240 years old, will be cut down Jan. 18. Knight, consulted by tree experts who made the decision, is resigned that the end has come. American elms are as old as the nation itself. In colonial Boston, the Sons of Liberty met under an American elm tree dubbed the Liberty Tree until it was cut down in 1775 by British loyalists. 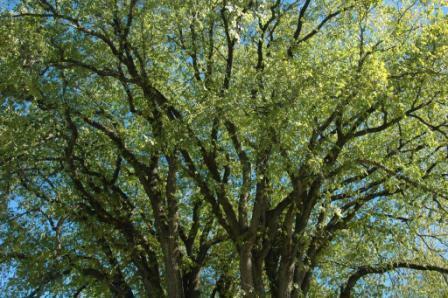 Eventually, American elms became the nation's most popular shade tree, their seeds carried westward by settlers. The trees lined streets in towns from coast to coast. But all that changed with startling speed because of the Dutch elm fungus, spread by bark beetles, beginning in Ohio in the 1930s. Once afflicted, elms faced a swift and an all-but-certain death. Diseased trees were quickly eliminated to save surrounding trees. As Dutch elm arrived in Yarmouth in 1956, Knight was already middle-aged - married and with a son, running a logging business - when he was named tree warden. 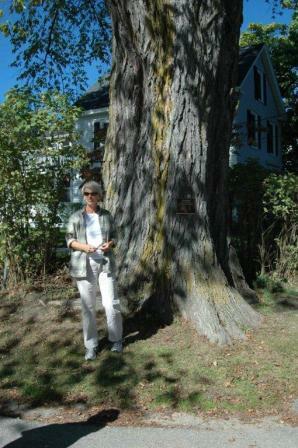 Saving Yarmouth's elms was an impossible task. Because elms had been planted in rows along streets, and because their roots became intertwined, one diseased tree could quickly infect its neighbors through their roots, taking out a block of trees in a matter of weeks, said Bill Livingston, a professor at the University of Maine. Urban trees were hit the hardest. In Yarmouth, for example, there were more than 700 elms before the disease swept through. Now a dozen of those original trees remain. The disease forever changed the looks of Main Street USA, claiming an estimated 100 million trees, all told. "These trees grew so fast and so tall that their branches would reach across the street where basically it became a tunnel," Livingston said. "When the disease came in, it eliminated all of the trees and created a completely different setting - from a shaded urban landscape into a clear-cut landscape." In the early days, the pesticide DDT was used to kill the bark beetles. Later, fungicides injected directly into the trees' roots had some success. Still, trees continued to die. Knight quickly learned he couldn't save all the elms, so he focused his efforts on one special tree. Its trunk was straight, and its limbs reached so far toward the heavens that its proud canopy, 120 feet wide, could be seen from miles away. "He was such a beautiful tree. That's why I wouldn't cut it," said Knight, resting at home in his favorite chair, family photos on the wall and two clocks ticking away the time. He instructed a crew to selectively prune away the damaged limbs. Over time, as the other elms succumbed, this tree somehow survived. And Knight's devotion grew. Knight checked on it weekly, sometimes daily. His wife, Fran, didn't mind sharing his affection. "My wife said, 'If that tree's name was Suzy, I'd be real jealous.' But she loved Herbie as much as I did," said Knight. Donna Felker, who grew up in the house that shares Herbie's shade, is credited with naming him. One girlhood summer, wood cutters preparing to trim away more diseased limbs encountered Felker and her friends. "'What are you going to do to Herbie? You can't cut Herbie,"' she recalled her friends' protesting. Felker, now 68, remembers that the tree was a giant, even back then - so big that her parents feared that if might take out their house if it fell. But it would have cost too much to cut him down, so Herbie prevailed. 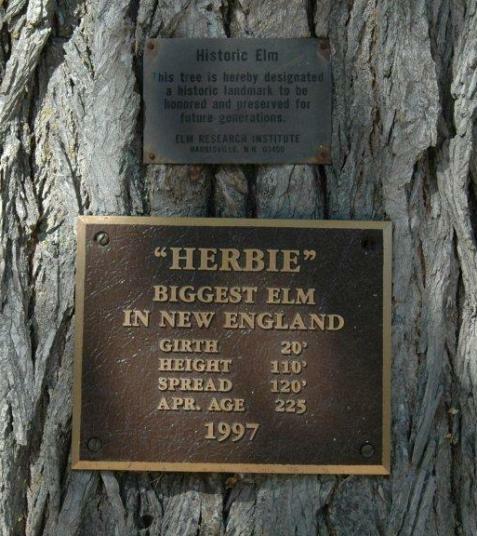 Over time, Herbie became a celebrity, nearly as famous for his ability to survive Dutch elm disease as for his massive height and canopy. Local schoolchildren learned about Herbie. Tree lovers from the world over came to see him or have their picture taken with him, Felker said. Knight remembers the time police checked out a gathering of young women around Herbie. They were trying to see how many people it would take to give his 20-foot-plus circumference a hug. "We used to say it took a family of five to hug Herbie. If you held hands around that trunk, and I've done it, that's what it took," said John Hansel, founder of the Elm Research Institute in Keene, N.H.
A tree the size of Herbie doesn't come down with a single cut and a shout of "Timber!" Since Herbie's trunk alone weighs about 10 tons, a crane will assist as he's carefully dissected, one massive limb at a time, said Ted Armstrong, arborist with Whitney Tree Service, which is handling the job. After he's cut down, Herbie's true age will be revealed once the rings are counted at his base. Herbie won't be hauled to the woodpile. Instead, his remains will be kiln-dried in a mill. He'll eventually be transformed into salad bowls, Christmas ornaments and furniture. The total cost of his removal will be about $20,000. A committee overseen by the new tree warden, Deb Hopkins, has been deciding how to divvy up Herbie's remains. Some of the wood will go to local artisans. Some will be auctioned, with part of the proceeds going to the town tree trust. Eventually, Hopkins hopes to build the tree fund to $200,000, with some being used to plant disease-resistant elms. Now, during the dark days of winter, Knight and Herbie face their mortality together. "His time has come," Knight said. "And mine is about due, too." Knight, who uses a walker, jokes that his secret to a long life is raw spinach and beer, which he has each day for lunch. He rides a stationary bike for a mile each day, as well. He admits that he doesn't understand his own longevity any more than he understands Herbie's. Knight's father died when he was 3, his mother when he was 4. His wife died 15 years ago from cancer. As the years passed, Knight thought for sure he'd be outlived by Herbie. But he's made his peace with his old friend's fate. "Nothing is forever. I don't want anybody to grieve when I go," he said. "Just be glad I could do what I did while I was here."